January joy could prove key to Glenavon’s end-of-season surge - that’s the view of boss Gary Hamilton. The Lurgan Blues head to Newry in search of a third successive Danske Bank Premiership victory for the first time since October and with a third-place league finish the ultimate target. Newry City AFC boss Darren Mullen. Pic by Pacemaker. Hamilton considers disruption due to multiple departures central to a lack of consistency but views the growing impact of New Year additions as cause for optimism. “We take confidence now from back-to-back home wins over Linfield and Dungannon Swifts, especially off the back of consecutive clean sheets,” said Hamilton. “So the aim is to continue to play with that same freedom in Newry. “I think we are starting to see the January signings really make a difference. “Seamus Sharkey and Eoin Wearen have both played for high-level teams in the League of Ireland. “You look at Saturday’s game and Eoin was superb in midfield to the point we were reluctant to make a change by switching him back into defence after Caolan Marron’s injury. “We had no option once Daniel Larmour then also went off injured but another January arrival, Robert Garrett, came on and was unfortunate not to score within a superb display, especially getting forward from midfield. “A crucial aspect to players like Eoin, Seamus, Robbie and Cameron Stewart is the mental strength they bring from past experiences at previous clubs. Hamilton has described that 2-1 win in August as “one when we got out of it what we didn’t deserve”. 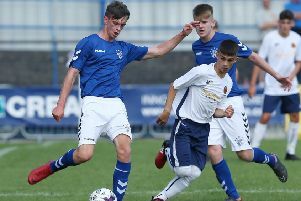 With just four wins from 32 fixtures, basement-based Newry have reasons to reflect over more than one past disappointment. “We’ve had our frustrations with decisions and moments not going our way but, ultimately, we cannot look for excuses,” said City boss Darren Mullen. “We are now, with six games left, at the stage when we need to start winning. “But we still look on a play-off spot as in our own hands. “Our games with Glenavon have included examples of not making the most of our opportunities. 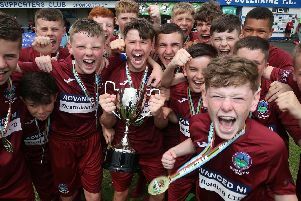 “Ards have had a lift with the change of manager but I look at our squad and the mood in training is as positive as it was last season when we were pushing for promotion out of the Championship. “We knew it was going to be a difficult season but I see the boys as up for this battle.